Mist rises during a late autumn morning, coloring the sunrise on the James River. The advent of Digital Photography introduced many changes for photographers, but I would have to say that the greatest alteration in my personal approach to the art was in the retention of “rejects.” Disk space is much cheaper and easier to maintain than physical storage, and so images that don’t survive one’s initial edit are retained, where, in the past, they were more likely to have made their way to the literal trash heap. The retention of all these images affords the opportunity to revisit the rejects and give them a second, or third, or fourth, viewing. We all change with time, our moods are constantly shifting, and our tastes and creative styles can vary. An image that was an immediate reject at first glance can elicit a much more positive appraisal at a future date. So it was with the image above. 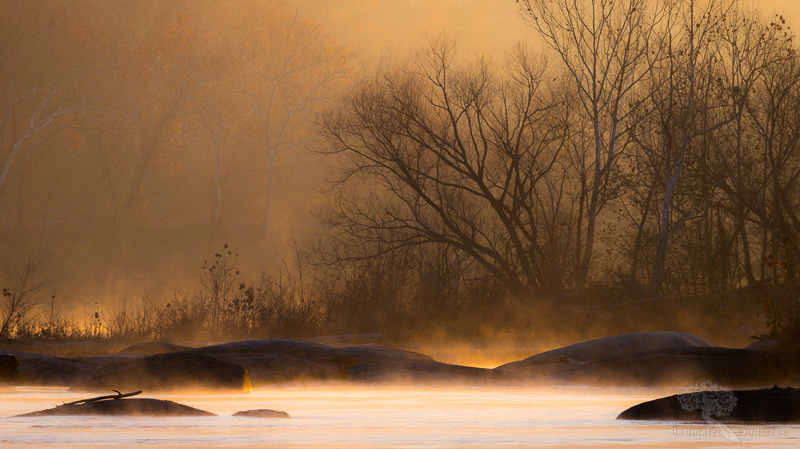 Taken on November 22, 2014, it was from a morning shoot on the James River that initially didn’t seem to have produced any images worthy of consideration at all. Just another nice, but unsuccessful, morning on the river. With film, I likely would have simply tossed the images into the trash and grumbled about the cost. However, being digital, I cataloged the images in my library (117,000+ images and growing!) and went about my business. About 6 months later, I took a second glance through the previous autumn’s images and thought there was potential with this one. I played with some black-and-white versions, some different crops, and eventually settled on a color version with the shadows deepened, the highlights brought up a touch and some negative clarity to accentuate the fog. But I still didn’t feel it was worthy of addition to my portfolio. It wasn’t until about 6 months later, a full year after capturing the image, that I again returned to the file and was inspired to slightly tweak the color balance and saturation, finally realizing the full potential of the image that had initially held no interest. What I like best about this image, now, is the ghostly nature of the trees in the background on the left side of the image, balanced against the mist rising in the sunlight among the rocks to the right. It is another example of a very “painterly” image which is my stylistic goal in just about everything I shoot. The crop is a 16:9 ratio, which is unusual in my portfolio, but which I feel works really well with this image. Cropped out of the top of the image are some patches of featureless open sky which detracted from tones and textures of the trees, and equally featureless water was cropped from the bottom. Taken with a Nikon D800 and a Nikkor 80-400mm lens zoomed all the way to 400mm. The exposure was 1/13th second @ f/22, ISO 100. Want to see this image on your wall? All my work is for sale in either unsigned, open editions or by contacting me for signed, limited editions. This entry was posted in James River, Landscape Photography, Musings/Ramblings, technique and tagged fog, James River, mist, Rocks, Sunrise, Trees, water.